Loic Remy and Eden Hazard both featured on the scoresheet as Chelsea scored a hard-fought victory over Stoke despite the magnificent goal by Charlie Adam in his own half. A win for the home side would relive ongoing pressure from the victorious Arsenal and Man Utd earlier in the day but Chelsea stood four points clear with two games in hand. Chelsea took control early and won a free-kick on the right. Willian whipped it in, but unable to find a blue shirt in space. With the Blues pressing around Stoke's area, Cahill managed to cross low and found Remy who's strike deflected and looked set to tumble past Begovic, but his vital movement across the goal line enabled him to palm away at full stretch. Mourinho's men continued to pile the pressure on Stoke early; implementing a nice tempo to the game. A mistake from the away side enabled Oscar to capitalize and scamper forward. His attempted lay-off didn't pay off and the ball fell to Remy, however his curling shot tumbled around the post. 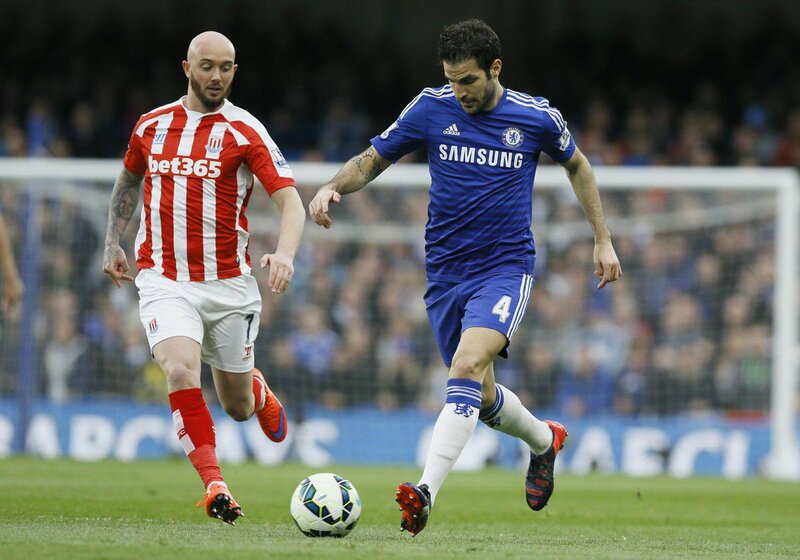 Sharp start from Chelsea and the early impressions were that it was going to be a long game for Stoke. Chelsea were knocking possession around beautifully, finding gaps and making Stoke work constantly. Fabregas rolled a sweet ball through to Remy but his shot pummeled against the defiant Begovic and the visitors cleared. They couldn't combat Chelsea's sublime movement across the pitch, but loose passes weren't making matters better either. Stoke began to grow into proceedings, they had slowed Chelsea's earlier pressure down and started moving forward up the host's half. Nzonzi picked up possession a fair few yards out and battered a strike at goal. 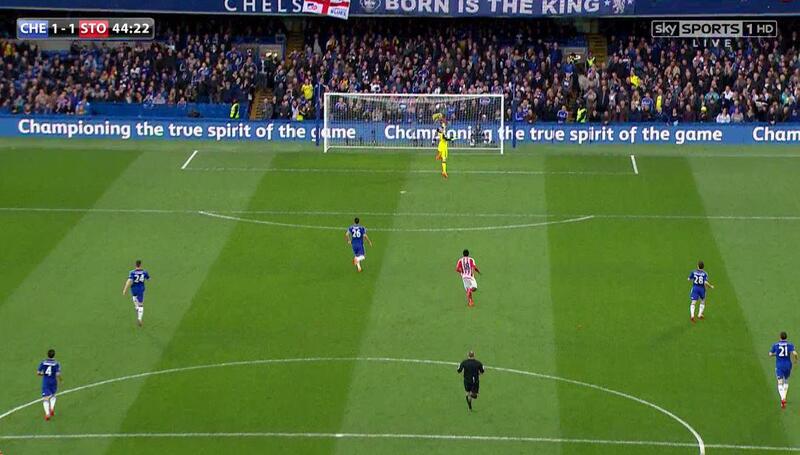 Courtois gave up on it, and could have been punished as it rocketed just over his crossbar. Tension started to creep within the home fans. Hazard proved his sublime class and dazzling footwork with a swift run around the area. The Belgian skipped past several defenders who looked frightened to make a challenge. He diverted from the right byline to a central position but his left-footed grass-cutter rolled into Begovic's grasp. One of Chelsea's best chances occurred when Remy, inside the area, superbly picked out Hazard with a side-pass. The Belgian cut back to Oscar at close range but his left-foot strike agonizingly rolled past the post. Terrific build-up play, lacked a final finish. Chelsea looked the most dangerous while creating chances down the right and their opening goal was assisted from play down there. Willian initially dribbled down the channel and slipped a pass through to Fabregas who smartly switched onto his left foot and fell to the ground after a clip to the ankles; giving Jonathan Moss no choice but to award a penalty. Up stepped Eden Hazard.... cool as you like. The Belgian smartly worked out which way Begovic was heading and slotted down the left to hand his side a deserving lead. Soon after, an incredibly bizarre equalizer occurred for the visitors. Charlie Adam had put his name on the list alongside Wayne Rooney and David Beckham for sensational strikes from the half-way line. Courtois' attention was grasped due to the injured Hazard on the floor, but Adam received possession in the middle of the park and battered a long shot at goal. It flew past the stunned Chelsea goalkeeper into goal as the flabbergasted Stamford Bridge watched on. Potential goal of the season. Willian whipped in a dangerous free-kick from the left, from which no player truly got on the end of. A deflected header from Walters piqued Begovic's conscience and the Stoke man turned the loose ball around his post. He had been terrific all game long. A huge blow occurred for Chelsea when star-striker Diego Costa injured his hamstring once again. The Spaniard was chasing a long ball until the unfortunate setback. Reports said that his scan completed gave him the all-clear to play but this injury may have ended his season prematurely. Begovic made a costly error with a mistimed throw that was swiftly intercepted by Hazard and the Belgian scampered forward. With assistance to his left, he laid off to Remy who slotted past the already-committed Begovic to double Chelsea's lead. 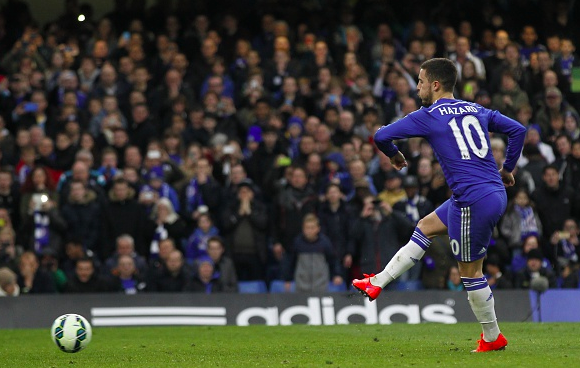 Chelsea almost hit a third when the dazzling footwork of Hazard tore Stoke apart. He retrieved possession outside the area, scampered down towards the left byline, dodged sliding tackles and pulled a pass back. It reached Willian but his effort pummeled against Begovic twice in a superb double-save by the Bosnian. Stoke were resilient until the final whistle and piled bodies forward whenever they retrieved possession. Hughes brought Crouch for the advantage in long balls but Chelsea stayed switched on and blocked out any danger late on. The final whistle sounded and Chelsea remained on course to claim the prestigious Premier League title as their victory over Stoke sent them seven points clear at the top. More: Should Sterling stay with Reds?